A premiere release: the complete keyboard music by Jacques Duphly! 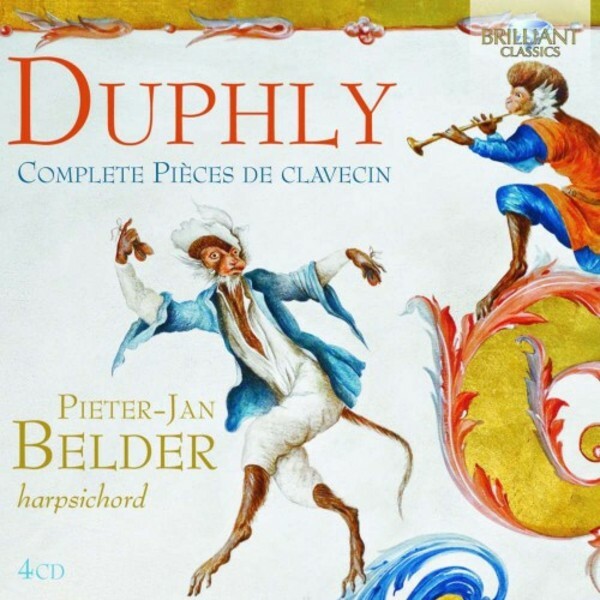 Duphly was one of the most famous keyboard virtuosos and composers of mid‐18th century France. This 4‐CD set presents his entire output for the keyboard, consisting of 4 books - Livres de Pi�ces de Clavecin. Written between 1744 and 1768, these important works mark the transition from the rich ornamented Baroque style to the more gallant style of the Classical Era, foreshadowing the early keyboard works by Mozart. An important release, and another feather in the cap of the indefatigable Pieter‐Jan Belder, one of the foremost keyboard players of today, with more than 100 CD�s to his name: complete Scarlatti Sonatas, complete Rameau, Marais, CPE Bach, Telemann, JS Bach and many others. One of Brilliant Classics� most prominent artists, Pieter‐Jan Belder is the perfect interpreter of these works, here using a harpsichord carefully modelled after a 1730 Blanchet model in order to create a highly authentic performance. Having already released works by CPE Bach, Soler and Rameau, not to mention his on-going recording of the Fitzwilliam Virginal Book, Belder is a sensitive and lyrical harpsichordist, with an assured touch that brings Duphly�s neglected oeuvre to life. He is joined by Japanese violinist Rie Kimura, who adds sparkling energy when Duphly calls for the addition of the violin. Liner notes written by Pieter‐Jan Belder.